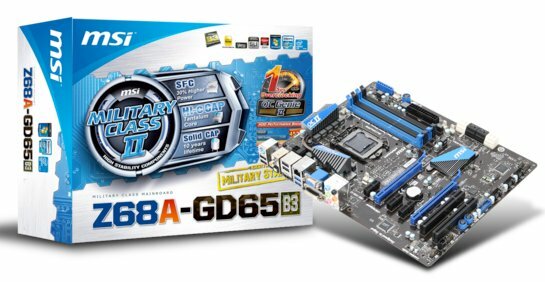 MSI announced the Z68A-GD65 (B3), a new motherboard for Sandy Bridge processors. It has two PCIe x16 slots, four SATA 6Gbps ports and four USB 3.0 ports. MSI, the worldwide innovator in Mainboards and Graphics Card technologies is continuing to deliver high quality Mainboards with its new Z68A-GD65 (B3). After continuing the successful P67 (B3) series, MSI officially announces its feature rich model with the latest Intel® Z68 (B3) Express chipset. Built with the best user experience and stability in mind, the MSI Z68A-GD65 (B3) mainboard features world's easiest overclocking method: OC Genie II. Stability is guaranteed through the use of MSI's exclusive Military Class II components and power consumption is lowered by the use of DrMOS and LucidLogix's new Virtu GPU Virtualization technology. MSI's OC Genie II is widely regarded as the easiest way to upgrade your PC's performance. Just with one single click of the button your whole computing experience will change. For the first time ever, OC Genie even improves your disk drive performance! Enabling OC Genie II in combination with Intel's Smart Response Technology upgrades your hard drive performance up-to 457%. Overall, the MSI Z68A-GD65 (B3) with OC Genie II becomes faster, smoother, more responsive and more enjoyable. MSI's Military Class II Components have undergone rigorous testing to comply with the United States Department of Defense Military Standard 810G, ensuring the best stability available. MSI's Military Class II Components show the stability anyone should expect from a mainboard that will always perform during stressful situations like playing games for an extended period of time, overclocking, or in system cases with inadequate cooling potential. Combining MSI's award winning power saving features -like DRMOS and Active Phase Switch (APS)- with LucidLogix's Virtu GPU Virtualization technology gives the best power consumption figures. Installing a powerful discrete graphics card in the MSI Z68A-GD65 (B3) does not lead to the normal increase in power consumption. Thanks to LucidLogix's Virtu technology, end-users can enjoy all the benefits of Intel's Sandy Bridge graphics like low power consumption, Quick Sync transcoding technology and still have all the benefits of a discrete graphics card with the latest DirectX 11 features and compute power. Thanks to MSI's dedication, end-users can enjoy all the features of Intel's newest Z68 Express chipset. All the Overclocking features are supported through OC Genie II and Instant OC (Control Center II.) which makes real-time overclocking possible without the need to reboot. The Z68A-GD65 (B3) features Intel® Visuals with integrated video out, Quick Sync, Intel® Insider™ and support for both AMD CrossFire™ and NVIDIA® SLI®. MSI's Super Charger for ultra-fast charging of USB devices and the finest audio standard: THX TruStudioPro also return on the Z68A-GD65 (B3).